We’re already working on the next update with a lot of new features and customizations. 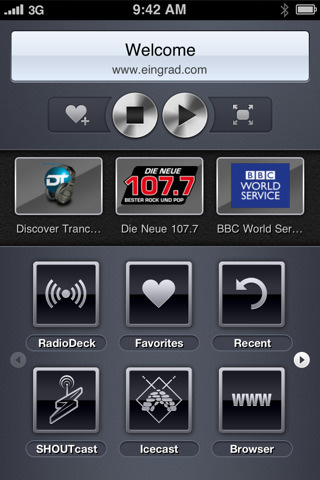 Listen to over 40.000 radio stations from RadioDeck, SHOUTcast Radio and Icecast Directory right on your iOS Device! Internet RadioBOX brings you free, independent, commercial, local and much more stations from all over the world. Find your desired station by location, genre, name or description. Visit the stations web pages, Facebook or follow them on Twitter. + Supports all iOS Devices with iOS 3.0 and above! + iPhone4 Retina display support! + Supported formats: MP3, AAC(+), WMA, VORBIS, ASF, MMS, ASX, PLS, M3U. + TimeShift. Pause & Resume your stream. + Supports 3G, EDGE and WiFi. + Beautiful and user friendly Interface. + RadioDeck: browse by country, genre or search. + Access to other popular radio directories: SHOUTcast Radio, Icecast Directory. + Built-in WWW internet browser. + Add custom radio station stream URLs. + Choose one of our beauty wallpapers or simply use your own from your photo library! + Sleep-Timer (stop after a certain time). + Twitter (post what you are listening).